Q: What services does window cleaning Covent Garden offer? A: The experts will perform exterior window cleaning with the help of modern water-fed pole gear on the market. For properties above the fourth storey, we'll send in seasoned climbers for rope access window cleaning. For internal pane polish, the team will employ standard ladders and squeegees. A: A handful of raindrops won't undermine the Covent Garden window cleaners' work – rainwater is usually deposit-free. However, if we face a cloudburst, then we will kindly ask you to suspend your appointment for another day. 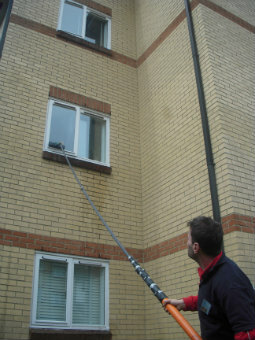 A: Yes, any PVC or UPVC frames and sills that your premises features will be cleaned for free as part of our service. A: As long as the specialists can pass through your front gate, they can wash away all dirt without you having to be close by. If your panes need a proper in-house polish as well, then we'll arrange a quick key pick-up and delivery service. A: Usually, the distilled water container inside the team's cleaning van is always full. In case the tank is empty and with your consent, the cleaners can effortlessly attach the water-fed rod to any unoccupied water source. Q: Do I need to meet any specific prerequisites before the team rings my doorbell? A: Once we tell you that the team's en route, you'll need to make sure that they can enter your premises unimpeded. In addition, the cleaners will require a parking space within 30 metres from your property and on the same side of the windows you want cleaned. When you hire a window cleaning Covent Garden session, you'll be able to renew the windows of any property at fair rates that remain unaffected by minimum contracts or concealed payments. See if you agree with our point of view – have a glimpse at our user-friendly price table below. With window cleaning in Covent Garden, you can swiftly remove ancient blemishes from any commercial or household property. Continue reading to find out how. To clean your windows' outer side, the practiced window cleaners in Covent Garden will install a new cleaning equipment – a water-fed pole that runs on distilled water. The cleaning tool's considerable reach (22 metres) allows the technicians to banish dirty spots from any four-storey property without using ladders or unhealthy cleaning products. To tackle stains on high properties, we've come up with a wholly different cleaning method – the rope access window cleaning. After evaluating your property's size and whereabouts, a team of proven abseilers will either use ropes or ladders and squeegees to reinstate the former glory of your panes. We always outline each session in advance to avoid mishaps and can provide you all the necessary COSHH documentation upon request. To refresh windows on the inside, the adepts may have to carry sponges and ladders to reach elevated areas. As our customer base broadened, we introduced our window cleaning in Covent Garden to include other London regions as well. Please consult with our concise list to learn which neighbouring locations we visit. For those of you who'd rather book window cleaning services Covent Garden EC1M online, fill in our get a free instant quote form.